In August 1862, Union and Confederate armies converged for a second time on the plains of Manassas. The naive enthusiasm that preceded the earlier encounter was gone. War was not the holiday outing or grand adventure envisioned by the young recruits of 1861. The contending forces, now made up of seasoned veterans, knew well the realities of war. The Battle of Second Manassas, covering three days, produced far greater carnage-3,300 killed-and brought the Confederacy to the height of its power. Still the battle did not weaken Northern resolve. The war's final outcome was yet unknown and it would be left to other battles to decide whether the sacrifice at Manassas was part of the high price of Southern independence, or the cost of one country again united under the national standard. After the Union defeat at Manassas in July 1861, Gen. George B. McClellan took command of the Federal forces in and around Washington and organized them into a formidable fighting machine - the Army of the Potomac. In March 1862, leaving a strong forces to cover the capital, McClellan shifted his army by water to Fort Monroe on the tip of the York-James peninsula, only 100 miles southeast of Richmond. Early in April he advanced toward the Confederate capital. At the same time, the scattered Federal forces in Northern Virginia were organized into the Army of Virginia under the command of Gen. John Pope, who arrived with a reputation freshly won in the war's western theater. Gambling that McClellan would cause no further trouble around Richmond, Lee sent Stonewall Jackson's corps northward to "suppress" Pope. Jackson clashed indecisively with part of Pope's troops at Cedar Mountain on August 9. Meanwhile, learning that the Army of the Potomac was withdrawing by water to join Pope, Lee marched with Gen. James Longstreet's corps to bolster Jackson. Pope successfully foiled Lee's attempts to gain a tactical advantage on the Rapidan by withdrawing his army to the north bank of the Rappahannock River. 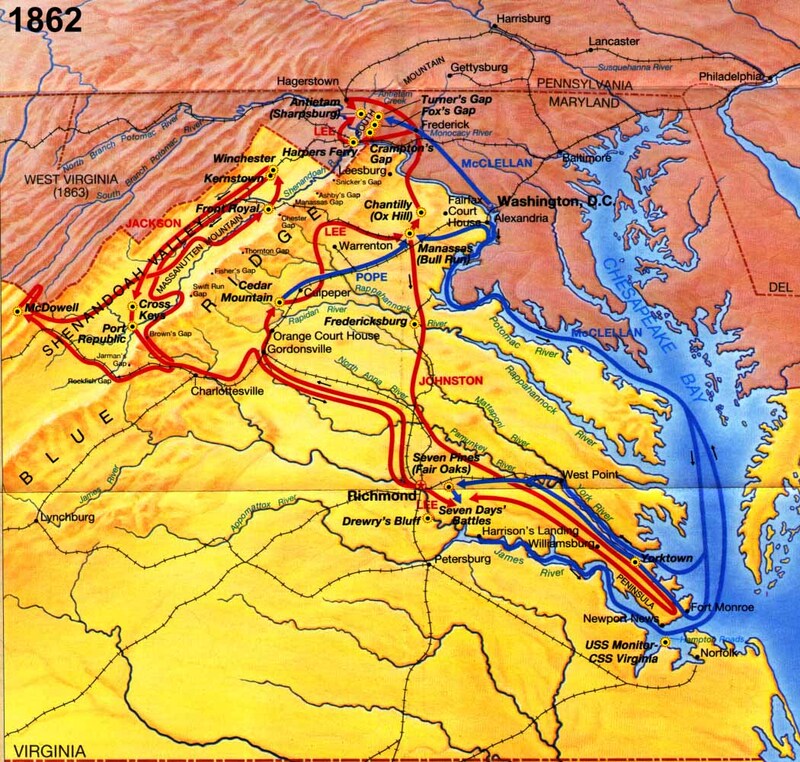 Lee knew that if he was to defeat Pope he would have to strike before McClellan's army arrived in Northern Virginia. On August 25 Lee boldly started Jackson's wing on a march of over 50 miles, around the Union right flank to strike at Pope's rear. Seeing the Union lines in disarray, Longstreet pushed his massive columns forward and staggered the Union left. Pope's army was faced with annihilation. Only a heroic stand by northern troops, first on Chinn Ridge and then once again on Henry Hill, bought time for Pope's hard pressed Union forces. Finally under cover of darkness the defeated Union army withdrew across the Bull Run toward the defenses of Washington. Lee's bold and brilliant Second Manassas campaign opened the way for the south's first invasion for the north, and a bid for foreign intervention.